Business is not combat. Combat implies conflict and resistance. It’s about winning, losing and survival. Survival is never fun. Business should be about cooperation, communication, and a commitment to a core set of values that serve others. It’s about relationships and results. 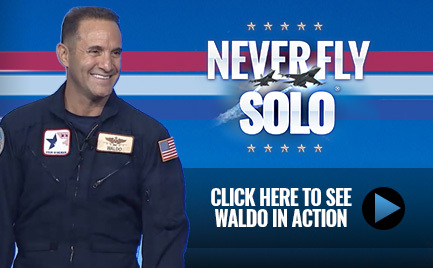 Since my days as a fighter pilot and in 2003 when I started my speaking business, I’ve learned that in business and life, we survive solo, but win together. True success is a bi-product of partnerships, collaboration and mutual trust. With our constantly changing business landscape, we need to break free of the combat mindset that is prevalent in a lot of the business community and embrace a culture of trust instead. Just like well trained fighter pilots, well trained organizations should never enter into combat. They should avoid it all all costs. After all, a great business strategy does not seek confrontation and should achieve its objectives without it. True, business is often competitive, highly stressful, and requires a tremendous amount of sacrifice. However, no matter how we look at it, our lives are never truly at risk in business as they are in actual combat. There are no missiles being fired and our lives are not threatened. Still, we can learn valuable lessons by exploring how we would perform if we were actually in combat, and applying it to business. By diligently preparing for each business mission and trusting in our leadership to provide a strategic vision and a set of objectives that are understood by all, we can maximize our ability to win. If we learn to overcome our fears, take courageous risks, and focus on the mission rather than ourselves, we can break performance barriers that have been limiting our growth. 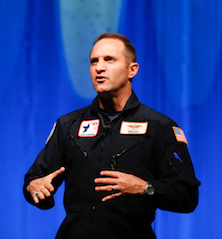 Finally, if we engage each business mission as if we are in combat and our lives (and our wingmen’s lives) depend on our success, think of how focused we would be! Think of how much we would want to win! This is what I call applying the “fighter pilot state of mind” to business. It is a spirit that is dedicated to superior performance and a commitment to excellence in all that we do. The key to winning in business comes down to TRUST — trust in yourself, trust in your team of wingmen and trust in your leadership. When you embrace trust and engage business missions with a cooperative mindset, your personal and organizational effectiveness will improve dramatically. With trust, you can help eliminate barriers that stifle productive business practices, maximize your personal performance and the value of your team, and build the relationships that really mean something in business. This is the ultimate philosophy of my life and my seminars. 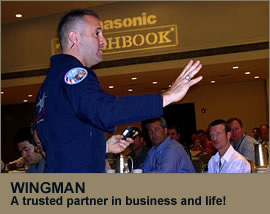 I’m proud to be your wingman and look forward to working with you!